Sanju had proclaimed his love of Brasserie Ciçou’s kouign amann in an earlier post. It has even earned it’s spot as one of Manila’s best desserts. 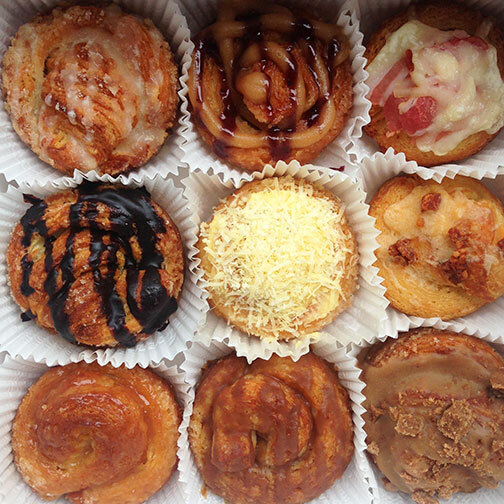 Cyrille Soenen has now taken his famous version of the kouign amann even further with a new stand-alone booth at the Mega Fashion Hall selling nothing but. KA by Ciçou carries noticeably smaller sized pastries as compared to the plated version at the Brasserie; but amped up with a mix of sweet and savoury flavors such as peanut butter and jelly, coffee, chorizo, caramel, bacon and ensaymada. They’re all pretty much still very decadent with that signature flaky, buttery pastry base. It’ll still make your head spin. I being a purist still prefer the original kouign amann served warm with a scoop of Cyrille’s salted caramel ice cream. But of all the flavors at KA, I pretty much like the lemon; which works much like a simple but sublime lemon, sugar and butter crepe. That citrus just cutting through the richness. Perfect with a cup of coffee. One pastry goes for about P50 on average and a box would definitely make for a premium Christmas gift or unique potluck contribution during this holiday season. It’s not a cronut, not an ensaymada and not a fruitcake .